There's a sign of just how dry the summer was. Water levels at Lake Como have receded so much the Forest Service removed the lake's boat dock for the season in early August. My kids and I went out to see the fall leaves and the lake, we were surprised how low it actually was. I guess I really have not taken the time to walk down to the lake in the fall. It was very quiet and peaceful, just a beautiful day! Lake Como is an agricultural reservoir for the Bitterroot Irrigation District, which draws water down for irrigators all over the valley. I have finally attached the outer border. I have the border applique to cut out and sew on then I am ready to quilt! There are 106 leaves to cut out and sew on so this will be an ongoing project. Below are the photos I took today. The photo below on the right is another project I started long ago, I am going to try to get the hand quilting finished this month. It will go in one of the newly painted rooms! 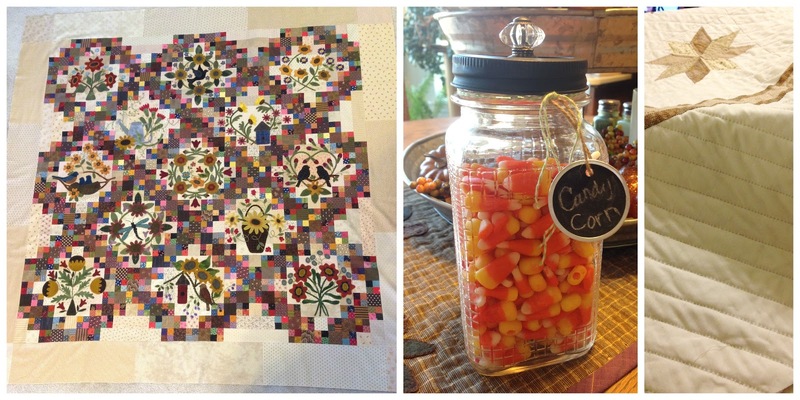 A little candy corn helps any project!